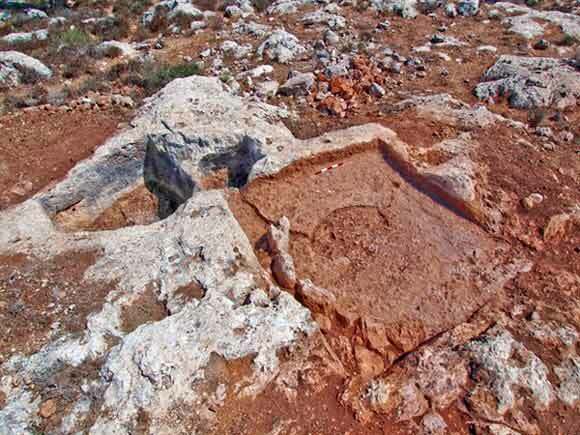 In September 2011, a salvage excavation was conducted south of Beit Iksa (Judea and Samaria License No. 15-3-2011; map ref. 216948/635117), next to the future Modiʽin-Jerusalem railway line. The excavation, on behalf of the Israel Antiquities Authority, was directed by Y. Aharonovich, with the assistance of S. Ammami (photography), P. Portonov (surveying), A. Harel (preparation of plans), H. Betan (preparation of maps) and m. Kanukian (drawing of small finds). 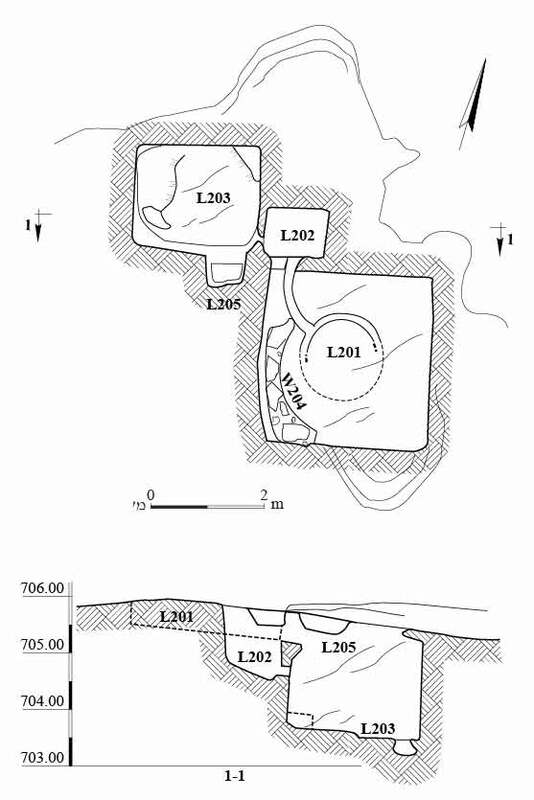 The excavation site was situated in the Jerusalem hills, south of the village of Beit Iksa, on a broad topographical terrace of the northern bank of Nahal Soreq, at an elevation of c. 700 m asl (Fig. 1). Remains of a single building, a quarry, a winepress and two tombs were unearthed in the excavation (Fig. 2) and apparently belonged to a nearby settlement, 300 m to the northwest, on the southwestern fringes of Beit Iksa (Feldstein et al. 1993:45*, Site No. 303) whose ancient name is unknown. The remains were dated to the late Hellenistic, Early Roman, late Byzantine and Umayyad periods. Building. A corner of a poorly preserved building was discovered. The foundations of two walls (W103—length 2.5 m, W104—length 5 m; Fig. 3) were all that survived of the structure. In the building’s foundations and the fill deposited between the walls to level the area (L106) were pottery sherds dating to the late Hellenistic period: a jar (Fig. 4:1), and the Early Roman period (first century BCE–first century CE): a bowl (Fig. 4:3) and a cooking pot (Fig. 4:5). Quarry. A few pottery sherds from the Second Temple and the Byzantine periods were found in the alluvium in a quarry (10.5 × 13.0 m, max. quarried depth in the northwestern corner 1.8 m). Winepress. The winepress, hewn in bedrock c. 25 m north of the quarry, consisted of a treading floor (L201; 2.70 × 3.05 m; Figs. 5, 6), a settling pit and a collecting vat. A rough surface in the center of the treading floor attests to an additional type of extraction process. The grape pomace, piled in the middle of the treading floor, was bound with a rope or contained within a wooden frame supported by a curved wall (W204). 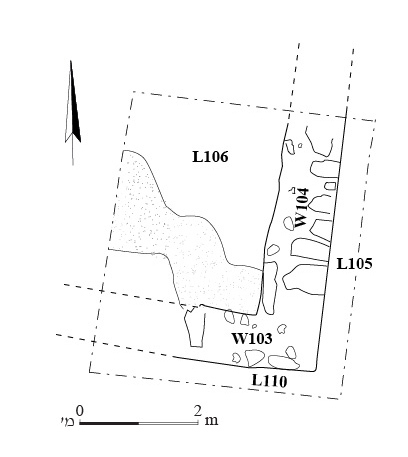 A channel (width 17 cm, depth 4–5 cm) leading to a settling pit (L202; 0.90 × 0.95 m, depth 1.1 m) was hewn in the floor. The must flowed into the collecting vat (L203; 1.8 × 2.2 m, depth 1.7 m) through a hole in the wall of the settling pit. 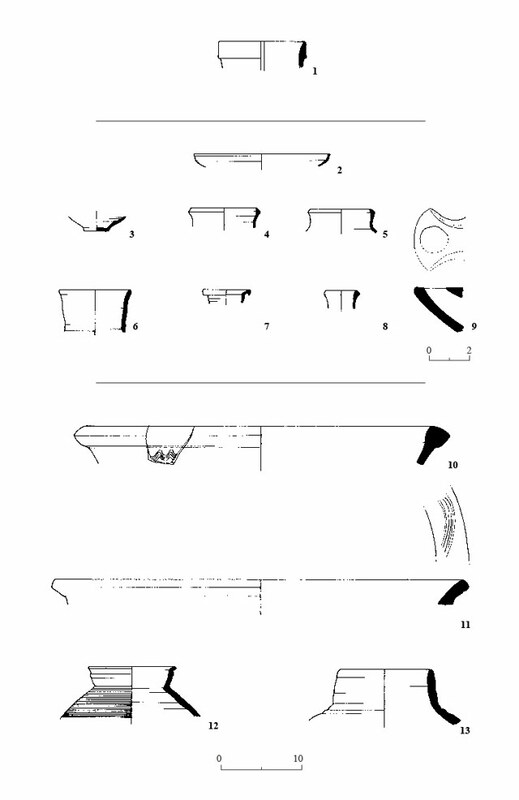 A kind of shelf for placing equipment (L205; 0.50–0.85 m, height 0.3 m) was hewn at the top of the collecting vat’s southwestern wall, and there was a step in the vat’s northeastern corner. Cracks and grooves in the bedrock were filled with white plaster mixed with small amounts of orange grog to prevent seepage. Frankel and Ayalon (1988:46) identified this type of winepress as a direct-pressure screw press with a single fixed screw. The winepress is dated to the late Byzantine–Umayyad periods based on the ceramic basins (Fig. 4:10, 11) and jars (Fig. 4:12, 13) collected in it. Tomb 101. Fronting the cave was a rock-hewn courtyard (L101; 2.1 × 2.3 m, max. depth 1.45 m; Figs. 7, 8) with a step (height 5 cm) in its eastern wall that led to a hewn loculus (L107; length 2 m, width 0.7 m, height 0.8 m) below the level of the courtyard. In the courtyard’s northern wall were signs of the incomplete hewing of another tomb. A framed opening (height 0.8 m) in this wall led to a cavity (depth 0.8 m). In the southeastern corner of the courtyard was a hewn oval perforation (0.12 × 0.24 m) through which rainwater flowed to a hewn drainage channel (L109; length 2 m, width 0.18–0.37 m, max. height 0.83 m) to prevent flooding. The pottery retrieved in the courtyard dates to the first century CE: a bowl (Fig. 4:2), a cooking pot (Fig. 4:4), a jar (Fig. 4:6), a jug (Fig. 4:7), a flask (Fig. 4:8) and a lamp (Fig. 4:9). Tomb 301. 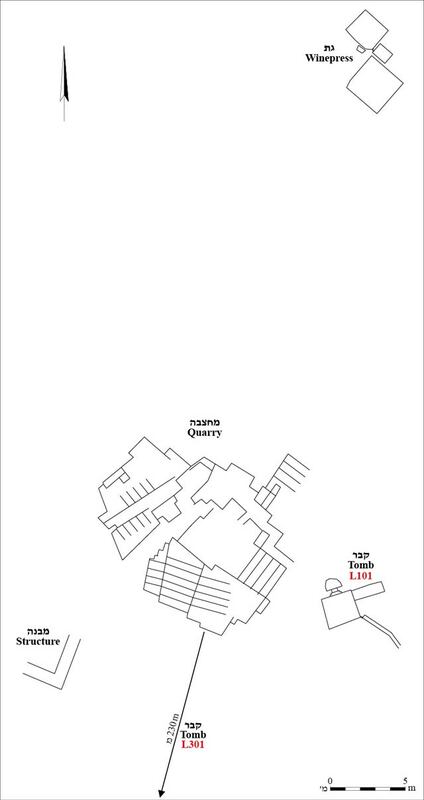 This was a single tomb situated c. 230 m southwest of the quarry, incompletely hewn. An opening (width 0.45 m, height 0.55 m) led into the tomb (L301; 1.1 × 1.4 m, height 1 m; Fig. 9). Rectangular niches, uniform in size (length 1.4 m, width 0.3 m, depth 0.3 m), were hewn into the long walls inside the tomb. 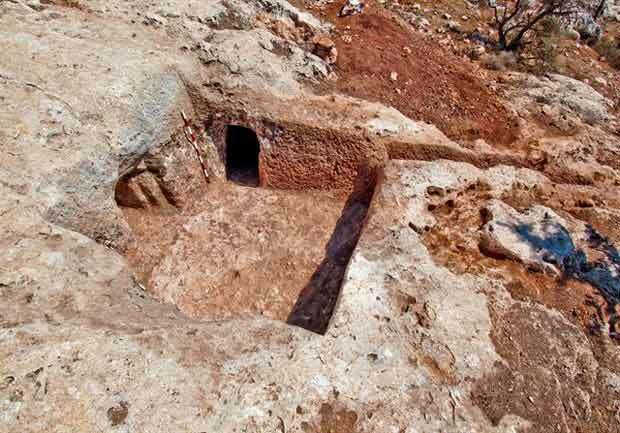 No finds were discovered inside or around the tomb. The remains belonged to the adjacent site on the outskirts of Beit Iksa, c. 300 m from the excavation site, where a large village (c. 35 dunams) was situated and whose broad periphery included quarries, burial grounds and agricultural areas including installations. The ceramic finds dated to the same periods identified in the mother settlement. Feldstein A., Kidron G., Hanin N., Kamaisky Y and Eitam D. 1993. 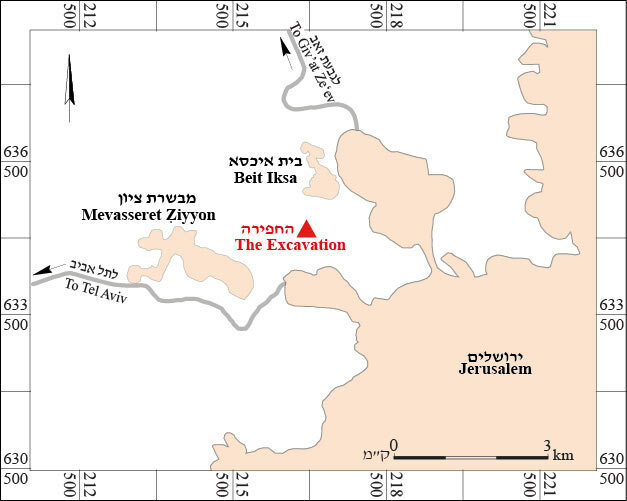 Southern part of the Maps of Ramallah and el-Bireh and northern part of the Map of ‘Ein Kerem (Sites 141–321). In I. Finkelstein and Y. Magen eds. Archaeological Survey of the Hill Country of Benjamin. Jerusalem. Pp. 133–264 (Hebrew; English summary, pp. 28*–47*). Frankel R. and Ayalon E. 1989. Vine, Wine Presses and Wine in Antiquity. Man and His World 5. Tel Aviv (Hebrew). 5. Winepress, plan and section. 7. 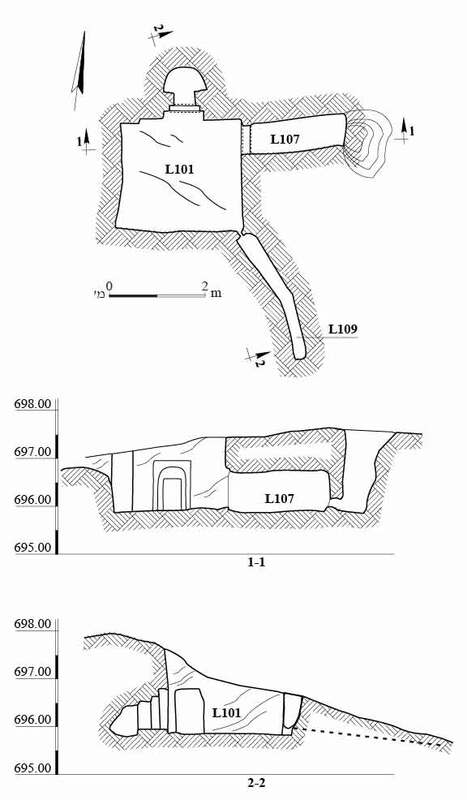 Tomb 101, plan and sections. 8. Tomb 101, looking northwest.